Don’t perform electroencephalography (EEG) for headaches. EEG has no advantage over clinical evaluation in diagnosing headache, does not improve outcomes and increases cost. Recurrent headache is the most common pain problem, affecting 15% to 20% of people. Don’t perform imaging of the carotid arteries for simple syncope without other neurologic symptoms. Occlusive carotid artery disease does not cause fainting but rather causes focal neurologic deficits such as unilateral weakness. Thus, carotid imaging will not identify the cause of the fainting and increases cost. Fainting is a frequent complaint, affecting 40% of people during their lifetime. Don’t use opioid or butalbital treatment for migraine except as a last resort. Opioid and butalbital treatment for migraine should be avoided because more effective, migraine-specific treatments are available. Frequent use of opioid and butalbital treatment can worsen headaches. Opioids should be reserved for those with medical conditions precluding the use of migraine-specific treatments or for those who fail these treatments. Don’t prescribe interferon-beta or glatiramer acetate to patients with disability from progressive, non-relapsing forms of multiple sclerosis. Interferon-beta and glatiramer acetate do not prevent the development of permanent disability in progressive forms of multiple sclerosis. These medications increase costs and have frequent side effects that may adversely affect quality of life. Don’t recommend CEA for asymptomatic carotid stenosis unless the complication rate is low (<3%). Reported complication rates vary widely by location (Kresowik), and are dependent on how complications are tracked (self-report vs. neurologist’s evaluation vs. administrative data (Wolff T). Despite calls for rigorous monitoring 15 years ago (Goldstein), most patients will likely need to rely on the surgeon’s self-reported rates. With more than 25,000 members, the American Academy of Neurology is the world’s largest association of neurologists dedicated to promoting the highest quality patient-centered neurologic care. A neurologist is a doctor with specialized training in diagnosing, treating and managing disorders of the brain and nervous system such as Alzheimer’s disease, stroke, Parkinson’s disease and epilepsy. The Academy provides valuable resources for neurologists and neuroscience professionals worldwide who look to the Academy for the most comprehensive professional development, career enhancement, and practice improvement opportunities available. 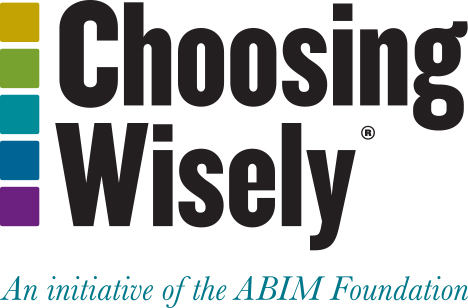 The American Academy of Neurology (AAN) established aChoosing Wisely® Working Group to develop its list of recommendations. Members of this group were selected to broadly represent varying practice settings and neurological subspecialties. Neurologists with methodological expertise in evidence-based medicine and practice guideline development were also included. The working group solicited recommendations from AAN members, which were then rated based upon their judgments of harm and benefit that would result based upon compliance with the recommendation. Based on committee voting and a literature review, candidate recommendations were sent to relevant AAN sections, committees, specialty societies and patient advocacy groups for review and comment. The working group reviewed this feedback and voted on the final Top Five recommendations, which were approved by the AAN Practice Committee and Board of Directors. AAN’s disclosure and conflict of interest policy can be found at www.aan.com. Gronseth GS, Greenberg MK. The utility of the electroencephalogram in the evaluation of patients presenting with headache: a review of the literature. Neurology [Internet]. 1995;45(7):1263-1267. Strickberger SA, Benson DW, Biaggioni I, Callans DJ, Cohen MI, Ellenbogen KA, Epstein AE, Friedman P, Goldberger J, Heidenreich PA, Klein GJ, Knight BP, Morillo CA, Myerburg RJ, Sila CA. AHA/ACCF scientific statement on the evaluation of Syncope: From the American Heart Association councils on clinical cardiology, cardiovascular nursing, cardiovascular disease in the young, and stroke, and the quality of care and outcomes research interdisciplinary working group; and the American College of Cardiology Foundation in collaboration with the Heart Rhythm Society. J Am Coll Cardiol [Internet]. 2006 January 17;47(2):473-84. The Task Force for the Diagnosis and Management of Syncope of the European Society of Cardiology. Guidelines for the diagnosis and management of syncope (version 2009). Eur Heart J. [Internet]. 2009 Aug 27Nov;30(21):2631-2671. National Institute for Health and Clinical Excellence. Transient loss of consciousness (‘Blackouts’) Management in adults and young people. [Internet]. London: Royal College of Physicians (UK); 2010 [cited 2012 Oct 25]. Available from: publications.nice.org.uk/transient-loss-of-consciousness-blackouts-management-in-adults-and-young-people-cg109/notes-on-the-scope-of-the-guidance. Silberstein SD; US Headache Consortium. Practice parameter: Evidence-based guidelines for migraine headache (an evidence-based review): Report of the Quality Standards Subcommittee of the American Academy of Neurology. Neurology [Internet]. 2000;55(6):754-762. Evers S, Afra J, Frese A, Goadsby PJ, Linde M, May A, Sandor PS, European Federation of Neurological Societies. EFNS guideline on the drug treatment of migraine – revised report of an EFNS task force. Eur J Neurol [Internet]. 2009 Sep;16(9):968-81. Institute for Clinical Systems Improvement. Headache, Diagnosis and Treatment of (Guideline) [Internet]. Bloomington, MN: Institute for Clinical Systems Improvement; 2011 [cited 2012 Oct 25]. Available from: www.icsi.org/headache/headache__diagnosis_and_treatment_of_2609.html. Rice GPA, Incorvaia B, Munari LM, Ebers G, Polman C, D’Amico R, Parmelli E, Filippini G. Interferon in relapsing-remitting multiple sclerosis. Cochrane Database Syst Rev. 2001, Issue 4. Art. No. : CD002002. DOI: 10.1002/14651858.CD002002. La Mantia L, Munari LM, Lovati R. Glatiramer acetate for multiple sclerosis. Cochrane Database Syst Rev. 2010, Issue 5. Art. No. : CD004678. DOI:10.1002/14651858.CD004678.pub2. La Mantia L, Vacchi L, Di Pietrantonj C, Ebers G, Rovaris M, Fredrikson S, Filippini G. Interferon beta for secondary progressive multiple sclerosis. Cochrane Database Syst Rev. 2012, Issue 1. Art. No. : CD005181. DOI: 10.1002/14651858.CD005181.pub3. Rojas JI, Romano M, Ciapponi A, Patrucco L, Cristiano E. Interferon Beta for Primary Progressive Multiple Sclerosis. Cochrane Database Syst Rev. 2010, Issue 1. Art. No. : CD006643. DOI: 10.1002/14651858.CD006643.pub3. Walker MD, Marler JR, Goldstein M, Grady PA, Toole JF, Baker WH, Castaldo JE, Chambless LE, Moore WS, Robertson JT, Young B, Howard VJ, Marler JR, Purvis S, Vernon DD, Needham K, Beck P, Celani VJ, Sauerbeck L, von Rajcs JA, Atkins D. Endarterectomy for asymptomatic carotid artery stenosis. Executive Committee for the Asymptomatic Carotid Atherosclerosis Study (ACAS). JAMA. 1995 May 10;273(18):1421-8. MRC Asymptomatic Carotid Surgery Trial (ACST) Collaborative Group. Prevention of disabling and fatal strokes by successful carotid endarterectomy in patients without recent neurological symptoms: randomized controlled trial. Lancet [Internet]. 2004 [cited 2013 Jan 3];363(9420):1491-1502. Goldstein LB, Bushnell CD, Adams RJ, Appel LJ, Braun LT, Chaturvedi S, Creager MA, Culebras A, Eckel RH, Hart RG, Hinchey JA, Howard VJ, Jauch EC, Levine SR, Meschia JF, Moore WS, Nixon JV, Pearson TA. Guidelines for the primary prevention of stroke: a guideline for healthcare professionals from the American Heart Association/American Stroke Association. Stroke [Internet]. 2011 Feb [cited 2013 Jan 3];42(2):517-84. Chaturvedi S, Bruno A, Feasby T, Holloway R, Benavente O, Cohen SN, Cote R, Hess D, Saver J, Spence JD, Stern B, Wilterdink J. Carotid endarterectomy: an evidence-based report of the Technology and Therapeutics Committee of the American Academy of Neurology. Neurology [Internet]. 2005 [cited 2013 Jan 3];65:794-801. Ricotta JJ, Aburahma A, Ascher E, Eskandari M, Faries P, Lal BK. Updated Society for Vascular Surgery guidelines for management of extracranial carotid disease. J Vasc Surg [Internet]. 2011 Sep [cited 2013 Jan 3];54(3)e1-31. Kresowik TF, Bratzler DW, Kresowik RA, Hendel ME, Grund SL, Brown KR, Niladena DS. Multistate improvement in process and outcomes of carotid endarterectomy. J Vasc Surg [Internet]. 2004 [cited 2013 Jan 3];39:372-380. Brott TG, Hobson RW II, Howard G, Roubin GS, Clark WM, Brooks W, Mackey A, Hill MD, Leimgruber PP, Sheffet AJ, Howard VJ, Moore WS, Voeks JH, Hopkins LN, Cutlip DE, Cohen DJ, Popma JJ, Ferguson RD, Cohen SN, Blackshear JL, Silver FL, Mohr JP, Lal BK, Meschia JF. Stenting versus endarterectomy for treatment of carotid-artery stenosis. N Engl J Med [Internet]. 2010 Jul 1 [cited 2013 Jan 3];363(1):11-23. Marquardt L, Geraghty OC, Mehta Z, Rothwell PM. Low risk of ipsilateral stroke in patients with asymptomatic carotid stenosis on best medical treatment: a prospective, population-based study. Stroke [Internet]. 2010 [cited 2013 Jan 1];41:e11-e7. Brott TG, Halperin JL, Abbara S, Bacharach JM, Barr JD, Bush RL, Cates CU, Creager MA, Fowler SB, Friday G, Hertzberg VS, McIff EB, Moore WS, Panagos PD, Riles TS, Rosenwasser RH, Taylor RJ. 2011 ASA/ACCF/AHA/AANS/ACR/ASNR/CNS/SAIP/SCAI/SIR/SNIS/SVM/SVS guideline on the management of patients with extracranial carotid and vertebral artery disease. Circulation [Internet]. 2011 [cited 2013 Jan 3];124:e54-e130. Wolff T,Guirguis-Blake J, Miller T, Gillespie M, Harris R. Screening For Asymptomatic Carotid Artery Stenosis. Rockville: Agency for Health Care Quality (US). 2007 Dec. Appendix 4-Evidence Table on Complication Rates for Carotid Endarterectomy. Goldstein LB, Moore WS, Robertson JT, Chaturvedi S. Complication rates for carotid endarterectomy—a call to action. Stroke [Internet]. 1997[cited 2013 Jan 3];28(5):889-890.